Advance tickets @ $15 were available from an GCMGA member through May 17th. Tickets are $20 the day of the tour, available at any Garden except McDaniel Farms. Our featured gardens include five certified National Wildlife Habitats, sun and shade gardens, a nature center and a circa 1930’s farm. This year we are showcasing a total of twelve gardens in our county: five private gardens and one grant project in the Duluth/Norcross area and five private gardens and one grant project in the Grayson/Snellville area. An overview of each tour garden follows. The fully detailed features of each garden can be read here. We look forward to having you visit our outstanding gardens! GCMGA works with Gwinnett County Parks and Recreation and the Environmental Heritage Center to plan, plant, and maintain the circa 1930’s “Archie’s Garden”, the farm house grounds, and the orchard at McDaniel Farm Park. Harvest from the vegetable garden is donated to “Feed the Hungry.” Be sure to visit the garden and see what a typical farm of the era would look like. This Certified Wildlife Habitat, located on Lake Norman, offers views of year round and migrating waterfowl, but gardening with beavers, geese, and deer can be challenging. You will find a butterfly attracting area, a tiered garden for vegetables and strawberries, an open area for croquet and volleyball, and a shady seating area. This 17-year-old yard contains a large number of mature specimens of flora. With its variety of plants in this sun/shade garden, there is something to enjoy throughout the year. A beautiful dry creek bed in back and stone pathways make for an interesting walkabout the yard. Because of all the hard work and planning over the years, the landscape is in place and complete making this a low maintenance yard. What was once a fescue lawn has been transformed into a Certified Wildlife Habitat and entirely organic garden. This home features flowers for hummingbirds along the driveway, a formal French style front yard, a side shade garden, and in the back a goldfish pond and raised beds for vegetable gardening. 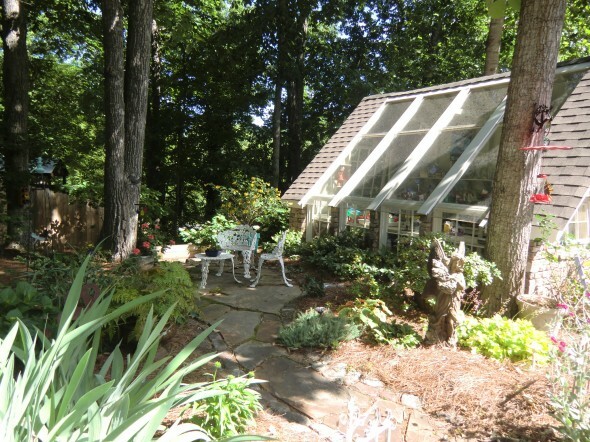 This eclectic, naturalistic, artistic garden is a little piece of paradise on a little over an acre. The garden integrates all five senses in various garden rooms. Through the use of trees and shrubs; fruits and vegetables; perennials and annuals; along with natives and exotics each garden room opens up a new vista. Early in the morning or in the evening it becomes the perfect place for entertaining. This garden will show you how you can garden in the shade and in the presence of deer. What was once a wild hill of hollies and English ivy has been transformed into a stone terraced jewel in the shade. The backyard around the pool has a tropical feel with huge elephant ears and other large leaved plants that take less sun. This garden was designed and installed by Jane Burke. The Mastley’s have transformed what once was a farm field into a delightful retreat. The community is called an airpark with airplane hangars in the backyards and access to a 2500’ runway. 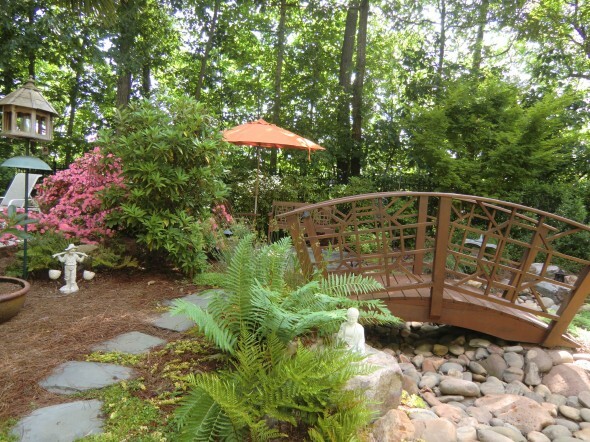 As you roam the 3.5 acre property you will see a variety of evergreens and hydrangeas and enjoy the peaceful serenity of the yard. From the deck area follow the steps to the iron fountain in a parterre garden of boxwoods. Six years ago this 3-acre garden was a bare piece of “Georgia concrete” scalped by contractors. The tree loving homeowners continue in their effort to turn this still new garden into a feast for the eyes and soul. The front, somewhat formal garden, is overflowing with a variety of evergreen and deciduous trees. The back yard highlights several intimate seating areas, water features, and gardens for vegetables, fruit, herbs, and wildflowers. This hidden gem of Gwinnett County on a 50-acre one-time farm owned by the Georgia Piedmont Land Trust (GPLT), a locally based conservation nonprofit, offers a unique learning opportunity. An informational tour will reveal garden design by a local well-known artist and nature enthusiast and will emphasize the value of selecting native plants and the effect of installing invasive nonnatives. Restoration and refocusing began in 2012 as a GCMGA grant project. Over the past ten years, this low maintenance cluster home garden, which is also a Certified Wildlife Habitat, has become a delight for the homeowners and the wildlife. Whether following a day of gardening or a day at the office, it is relaxing to sit under the pergola and enjoy the backyard privacy this garden provides. It is just a wonderful place to read a good book, become inspired to plan the next garden project or just sit back and watch the wildlife frolic. The Russell’s have turned their home into a wonderland for animal lovers. This Certified Wildlife Habitat resides next to two wildlife-attracting ponds in an informal garden setting. The four acre property has mature landscaping of tall, shady native oaks, dotted with an array of other sturdy drought tolerant plantings of trees and a wide variety of other colorful and attractive plants and flowers along with a haven for farm and pet animals. Georgia landscape architect, Jane Bath, designed the mostly sunny front landscape. An English cottage style garden follows the driveway then wraps around the side and rear of the house. The backyard, once a vine covered overgrown wooded area, is now a Certified Wildlife Habitat. Gravel pathways, vine and moss covered retaining walls and the two-tier, pondless waterfall provide areas for relaxing and enjoying nature. Saturday, May 19, 2012 – 10 a.m. until 5 p.m. Proceeds from the garden tour and plant sale benefit the community projects of the Gwinnett Master Gardeners. Master Gardeners will be available at each site to answer your questions and handle ticket. Plants will be available for purchase at one of the gardens. The location will be announced closer to tour day. Please check our website for the location. Tickets may be purchased on the day of the tour at any of the three private gardens. Tickets purchased on tour day are $20. Tickets will not be available at Harvest Farm or Parsons Elementary School. Please check our website before you begin the tour for any new garden tour information or possible changes. No strollers in the gardens. Parents must hold their children’s hands. No pets are allowed in the gardens. The garden tour will be held rain or shine. Gardens are not wheelchair accessible. 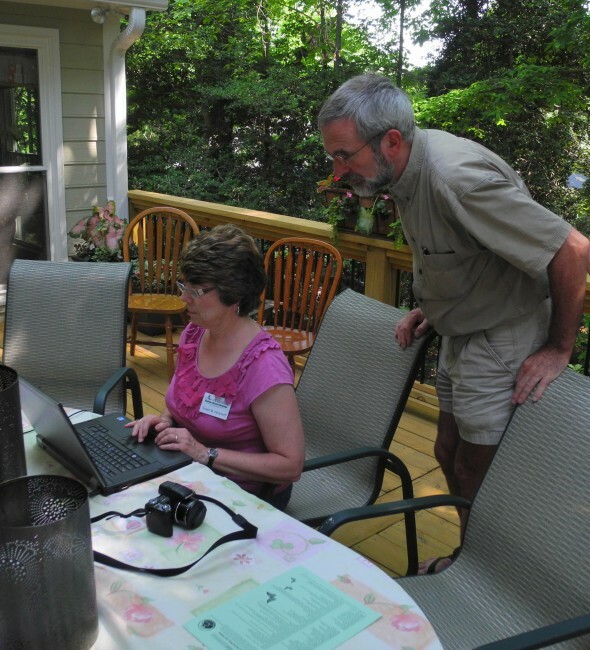 By foot and by car pool, family, neighbors, friends, fellow Master Gardeners, and the general public found their way to my Lilburn garden and that of my neighbor’s for the Gwinnett County Master Gardener’s Garden Tour on May 21. Approximately 100 people, ages 4 years old to 80-something, wound their way around my planet friendly landscape. They paused first to admire the front yard koi pond outfitted with biological filter built 20 years ago by my three sons and my husband. The most frequently asked question – how do you prevent the great blue heron from dining on the fish?? Answer – We can’t. Note the absence of small and medium size fish. Visitors next circled the front perennial beds that include an herb garden that attracts beneficial insects to keep the pests under control. Then they descended stone steps into the wooded back yard where a pure white marble Vietnamese statue stands under the canopy of trees. From this point, visitors could meander along walkways through beds of native and shade loving plants. Following the tour, visitors relaxed on the deck overlooking the backyard to sip lemonade and to enjoy homemade pound cake with farm fresh strawberries. When they finished, I pointed them down the street to Jane Trentin’s native plant garden. The entire experience was gratifying for me. The pre-tour offered an opportunity to visit my fellow Master Gardener’s beautiful and charming gardens they had labored lovingly over. The visitors to my garden were very interesting and included doctors, environmental educators, and specialists in native plants, birds, and insects, and avid gardeners looking for new ideas or a fun outing. Dr. John Pickering, a UGA entomologist, showcased his Discover Life program which helps identify trees, plants and insects. Sue Shaw’s front yard consists of a rose garden and azalea lined driveway leading to a front courtyard with hellebores, ferns, heuchera, macrophyla hydrangeas and callas. The greenhouse shade garden is home to Annabelle and lacecap hydrangeas as well as trillium, ferns and other shade plants. The backyard and pool area is a tropical Shangri-La with 25′ windmill palm and separate Japanese garden and sitting area.